Lake Urmia in the north-western corner of Iran is one of the largest permanent hyper saline lakes in the world and the largest lake in the Middle East. It extends as much as 140 km from north to south and is as wide as 85 km east to west during high water periods. The lake was declared a Wetland of International Importance by the Ramsar Convention in 1971 and designated a UNESCO Biosphere Reserve in 1976. The lake itself is home to a unique brine shrimp species, Artemia urmiana, and along with the surrounding wetlands and upland habitat, it supports many species of reptiles, amphibians and mammals. 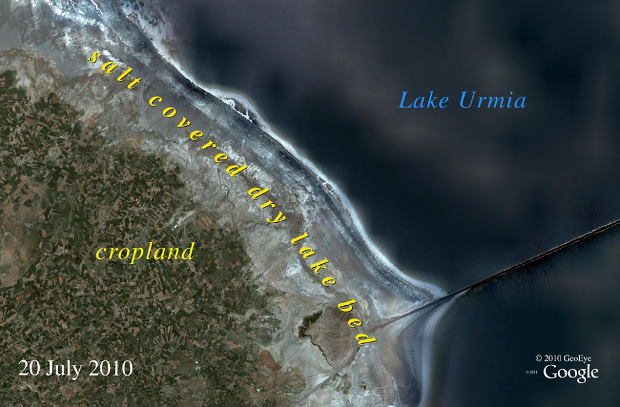 Lake Urmia provides very important seasonal habitat for many species of migrating birds. Around 200 species of birds have been documented on and surrounding the lake including pelicans, egrets, ducks, and flamingos. The watershed of the lake is an important agricultural region with a population of around 6.4 million people; an estimated 76 million people live within a radius of 500 km. Reduced water volume in the lake has already concentrated the existing salts to 300 g/L or higher in many locations. Sodium chloride concentrations much over 320 g/L are believed to be fatal to the lake’s brine shrimp. Optimal conditions for Artemia urmiana appear to be at salt concentrations well under 200 g/L and as salinity raises much above this level, there is a measured negative impact on growth rate, reproduction and mortality1. According to the research by United Nations Environment Programme (UNEP), Water use within the Lake Urmia basin at current rates is unsustainable without loss of the lake, and the consequent environmental damage as well as damage to the surrounding population and agriculture. In very simple terms, Lake Urmia needs more water coming in—either from inside or from outside the basin—to avoid an environmental tragedy. The lake’s brine shrimp are the sole link between the primary production of the lake’s algae and the diverse migratory bird population which feeds on these shrimp. Because the brine shrimp occupy this crucial link in the ecosystem their demise would translate into the likely loss of many of Lake Urmia’s migratory bird populations and affect the entire ecosystem’s sustainability. Any current or future tourist trade focused on these bird populations would likely also decline dramatically. As lake levels decline, the exposed lakebed is left with a covering of salts, primarily sodium chloride, making a great salty desert on much of the 400 km² of lost surface area. These salt flats will not support agriculture and inhibit growth of most natural vegetation. 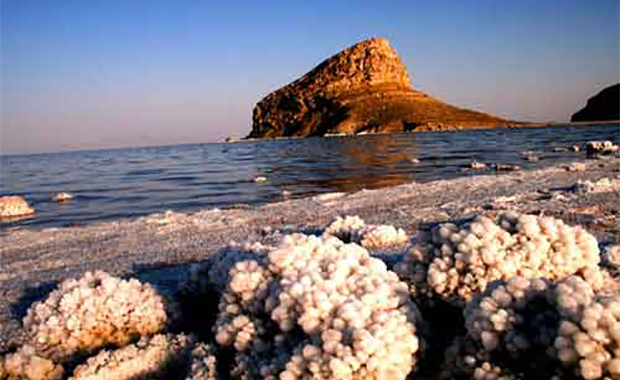 The salts are also susceptible to blowing and will likely create “salt-storms” like the ones that have resulted from the drying of the Aral Sea, located 1 200 km to the northeast of Lake Urmia. Blowing salts from the Aral Sea have been linked to vegetation-mortality in some cases or, more frequently, reduced vegetation growth, reduced crop yields, ill effects on wild and domestic animals, respiratory illness, eye problems, and throat and esophageal cancer. Based on the experience of the Aral Sea salt storms, it is likely that many of the tens of millions of people who live within a few hundred kilometres of the lake will be close enough to experience the impact of these salt storms. Based on IRNA News Agency from Urima, on Saturday, Hassan Abbasnejad, General Manager of Environmental Protection for West Azerbaijan Province said in the ecosystem management workshop of Urmiye Lake, 85% of the total area of the Urmiye Lake has been dried just remains six percent of the southern part of the lake that brings with it devastating consequence for people of this Province and its neighbours. Following the crisis that is facing the Lake Urmia, it will be inevitable increased risk of cancer and other respiratory diseases in people who are affected by the consequences of the Lake drying, added Abbasnejad. Jahangirzadeh MP for Urmia Province stated: “we need to take an immediate action also funding 3 billion on saving Lake Urmiye. Nothing will happen even with the closure of illegal wells just will be serious damage the agriculture industry and farmers”. For example, projects such as transfer of the Caspian Sea to Lake Urmiye likewise cloud seeding is on the agenda but it is unclear how much funding is needs, when it begins and when it ends, Jahangirzadeh remarked. Addressing to the crisis Lake Urmiye has been declared one of the agenda Masoumeh Ebtekar Iran’s Vice President and Head of Environmental Protection Organization but no report has been published yet to take the necessary steps to save the Lake Urmiye by the government. The land left behind as the lake retreats is covered with salt deposits that make it unusable for agriculture. The causeway across the lake can be seen in the lower right of the image.